Hillsborough will never be forgotten. Those 96 souls that went to see a football match and never came home have their names etched into the history of football forever now, and rightly so. I don’t want to dwell too much on the events of the day, many words have been written by people much better qualified to talk about it than me. 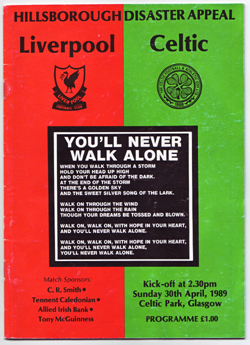 Celtic extended an offer to play Liverpool in a memorial fundraising game at Parkhead, Liverpool’s first game after that horrible day. The game was the day before my 14th birthday, and I just knew we had to be there. I was a Dalglish fan before I was a Celtic fan. My first kit was Scotland’s from the 82 World Cup, with the 7 on the back for Dalglish. Liverpool were my English team, still are. Hillsborough hit me harder than I wanted to admit, being a moody teenager and all. My Dad had driven us down to Liverpool after what happened to sign the book of remembrance at Liverpool Cathedral and then to Anfield, and I left a green and white hooped scarf at the ground; it was lost among hundreds, thousands of other scarves and shirts from supporters of clubs all over the country, from all over Europe. The day of the game, it just felt… numb. The usual excitement about going to Paradise just wasn’t there. How could it be? This was a somber time. Usually, the Mighty Liverpool coming to town would have us all buzzing, but this was different. Going to the ground, I wasn’t the only one feeling it. Lots of people, tears streaming down their faces hugging each other. Not just Celtic fans. Liverpool fans that had come up for the game, seemed to be using this as a therapy. Scarves, shirts, badges and stories were being swapped among fans freely. Into the ground we headed. The Jungle looked packed to exploding point, and I felt a bit uneasy about going in among that many people to our usual standing point, just level with the 18 yard line at the Celtic end. We instead stood at the terrace behind the Celtic end, about halfway up. From there, we could see all of The Jungle, heaving and swaying under the sheer weight of emotion. I saw countless Liverpool shirts around me, and in the Jungle – not to mention Everton, Manchester United, Aberdeen, Dundee United, even Rangers shirts. Nobody cared that day. We were all just FOOTBALL fans. You’ll Never Walk Alone was sung with gusto, and with emotion. I couldn’t finish for tears in my eyes. I just mouthed the words and made sure I looked away from my Dad, couldn’t let him see me crying, not over a song… until I looked round and he had tears in his eyes too. Everybody around me did. The game? I remember we got beat 4-0. I remember Dalglish. I remember applauding every goal. That’s it. The 90 minutes on the pitch remains a blur to me. I’ve seen documentaries, and footage of the match… but it’s all a foggy memory. What I do remember is that by the time we shuffled our way out of the ground, through the mass of football fans gathered at the gates, by the time we walked back to where the car was parked, my Dad and I didn’t talk about the match once. When I sat in the car, I felt like I’d been awake for days. I’ve never, ever felt as emotional at a football match as I did that day. I’ve been to Anfield a few times since, and every time I go, I make a point of looking at the Hillsborough memorial; reading each name and thinking how I would feel if it was my son that didn’t come home from the football now. What Celtic and our fans did wasn’t much in the grand scheme of things, but it was a step. It was a foot in the right direction, and I have never been prouder to say “I was there” than that game.